Hazel is a glass artist based in Aberdeenshire. She recently graduated from Gray’s School of Art with a BA HONS in Three Dimensional Design specialising in glass and ceramics in 2016. Hazel works primarily with warm glass techniques, experimenting with many kiln formed processes such as fusing, drop forming and casting. Hazel is constantly trying to push the boundaries of glass and develop her practice in this fascinating medium. Hazel is inspired by nature and the changing seasons. 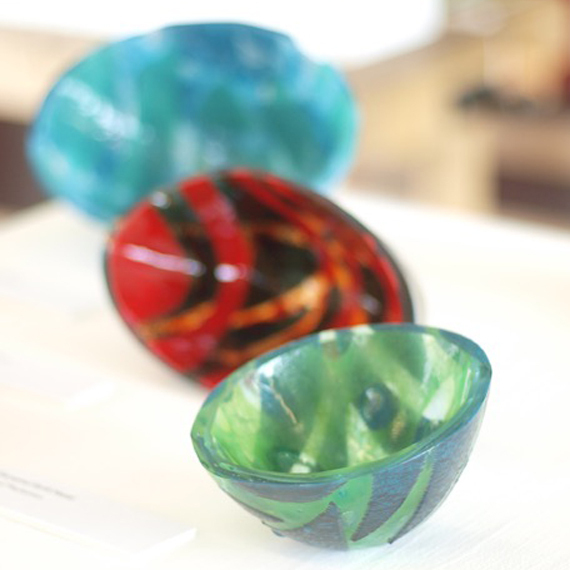 Currently Hazel is focussing on creating exciting colour, pattern and textures on glass and making it into beautiful three dimensional forms. She is also an artist in residence at Gray’s School of Art assisting students with their own glass techniques.